Teasel is considered a highly invasive weed in the United States. This native European plant was introduced in America during the 1800s and cultivated for textiles' manufacturing processes. 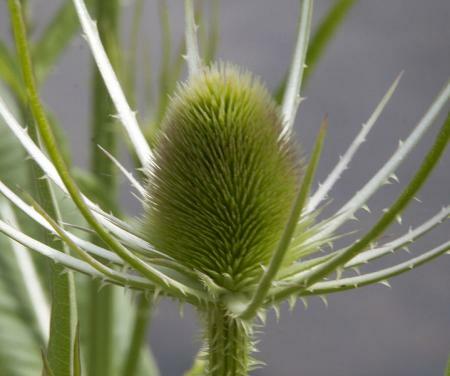 Many people confuse teasel with thistles since at first glance they appear alike. However, the two plants have very distinct differences that can help you identify them. The teasel has a very large head and a small flower. 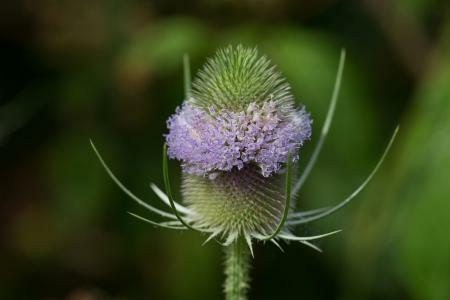 The teasel flower also has sharp bracts (pointy, prickly leaves). Bracts are typically found between the leaves and the flower, but in teasels the bracts are found within the flower and above the flower. The head forms a cone shape with bracts protruding from it. Teasels grow between 2' and 6' tall. The teasel has a series of elongated sharp bracts that grow upward from the base of the flower head. 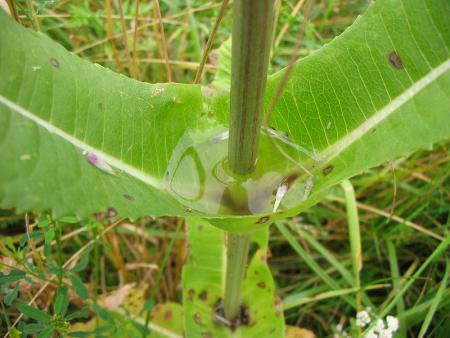 The leaves grow tightly around the stem to form a cuplike shape that can hold water. A teasel seed doesn't have a pappus and produces a simple seed. Some teasels are perennial (grow year after year) and others are biennial. Biennials take two years to grow from seed to flower, produce seeds and then die. A thistle has a flower head on top and the bracts under the flower head. Directly below the flower head, you can find a few longer bracts sticking out. Unlike the teasel that has spiny bracts within the flower, a thistle flower is free of bracts. 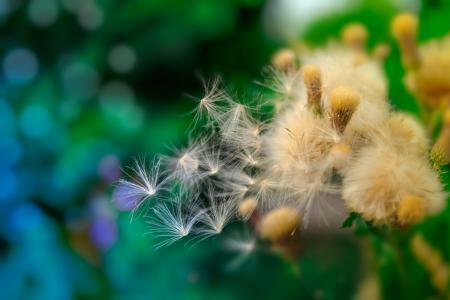 The thistle seed has a feather-like pappus (similar to dandelions) that enables the seed to be lifted by the wind and transported so it can spread. 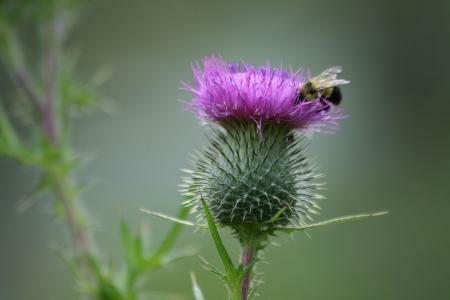 Some thistles grow between 2" and 8" tall while others, like tall thistles, grow between 3' and 8' tall. Depending on the variety, a thistle life cycle is either perennial or biennial. The United States Department of Agriculture (USDA) Field Guide lists teasel as an invasive and noxious weed in New Mexico. Teasel is aggressive and crowds out native and other desirable plants. This impacts the animals' ability to forage and forces them to relocate in search of food. The plant taproot during early growth reaches two feet deep. This makes uprooting the plant by hand difficult. Teasel grows from seed dispersion and one plant produces 2,000 seeds each year (2-year life span). 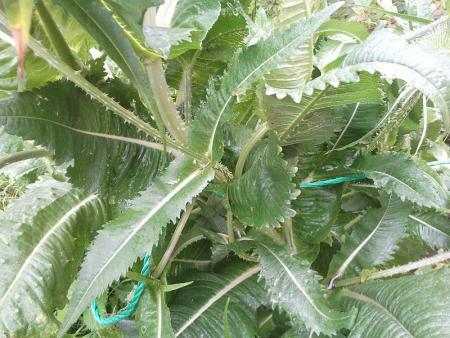 This makes teasel prolific and invasive. The USDA advises that prevention and early detection are the most effective management tools in stopping the spread of teasel. The best way to control the growth of teasel is to identify and remove any new or small teasel plants. Removing new and small teasel plants prevents them from blooming and spreading seeds. You can hand-pull young teasel plants, but don't leave immature seed heads that will ripen and disperse. Dispose of plants by burning or place in trash bags for the landfill. 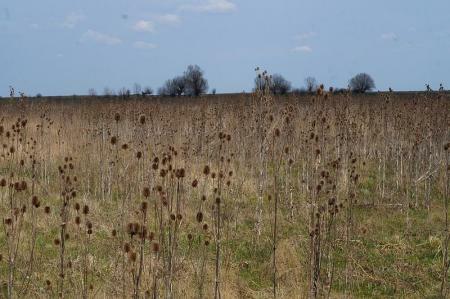 The goal to control and contain teasel plant growth requires other measures for larger plants. These methods often require long-term planning, management and follow-up to monitor the success of treatments. Chemical methods, such as weedkillers can be used on large infestations. Certified weed-free seeds and hay should be used when replanting fields. Taproots can be cut a few inches below the soil line. Large areas can be plowed or mowed to discourage growth when done prior to blooming or seed maturation. Monitor areas you've treated with weedkillers, plowing or mowing, and repeat as necessary. One way to further control the spreading of teasel is through cultural education. Many florists add dried teasel to floral arrangements that often are thrown out after use. 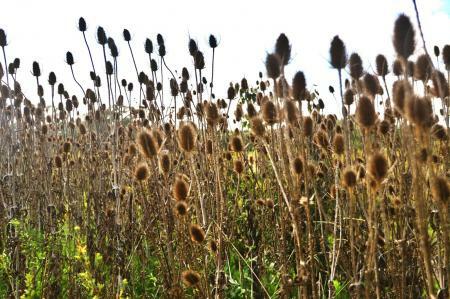 There are other dried plants that can be used instead of teasel. Other cultural control is through the education of land management, road crews, local government land maintenance and others attending to land development. 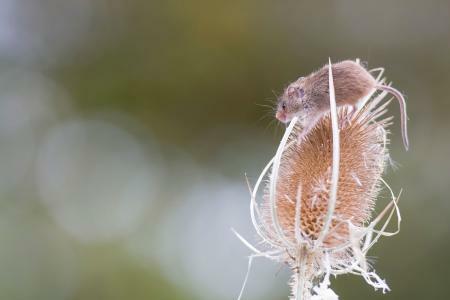 While some gardeners may believe growing teasel is a good idea, especially for medicinal purposes, such undertakings should be highly controlled and monitored. The medicinal benefits of teasel haven't been proven, but many herbalists and traditional medicine advocates claim teasel has great healing properties for various diseases. Teasel root extract is used for several ailments as a medicinal plant. A study conducted using teasel root extract didn't show any inhibition to the growth of spirochetes (spiral bacteria). Some people use a teasel tincture to treat Lyme disease although there are no studies to validate these claims. 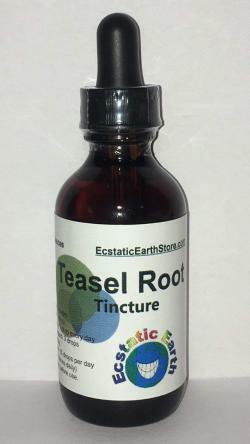 Teasel tincture reviews claim that the plant helps treat the symptoms of those suffering from Lyme disease. Teasel is used for acne washes. A traditional use was to gather the water collected by the leaves that form a cup shape under the flower head. This water was used to wash the face to treat acne. It was also used to treat eye infections. 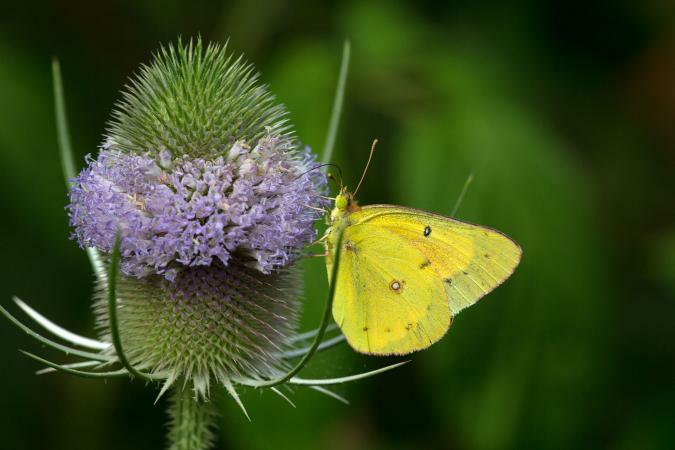 Other homeopathy treatments using teasel include cancerous sores, warts, stomach tonic and treating jaundice. Learning about teasel helps gardeners understand different ways they can combat and prevent the spreading of this invasive plant. While there may be valid medicinal uses for this plant, it still needs to be maintained and controlled to ensure other species aren't crowded out of their natural habitats.